I know, I know, this is more of a Gusteau-Remy drunken moment, so before I get into trouble with unauthorized references, I’ll come clean – I just made that up. There was no beer talk between Uncle Ben and Peter… or was there? Ok, let’s change the topic. Since Oktoberfest is coming pretty soon, everyone will find an excuse (do we need one?) to consume gallons of beer. So what could be more perfect than a recipe that pairs well with ice-cold beer? Actually, anything goes perfectly well with cold beer!!! While I am the greatest fan of the Filipino style of bbqing AKA pork cutlets skewered on sticks, basted with a ketchupy bbq sauce concoction, anything bbq is really a favorite of mine. So, if you’re not in the mood to fire up your grill, firing up your oven is a good alternative. Season ribs with salt and pepper, and garlic powder. Transfer to a roasting pan and cover tightly with aluminum foil. Take out from the oven and remove cover. Flip the ribs to expose the side that were touching the bottom of the pan and continue baking for 15 more minutes, this time uncovered. You can skip this step by pan frying the ribs with a little bit of olive oil, just to lightly brown and sear the sides of the meat. 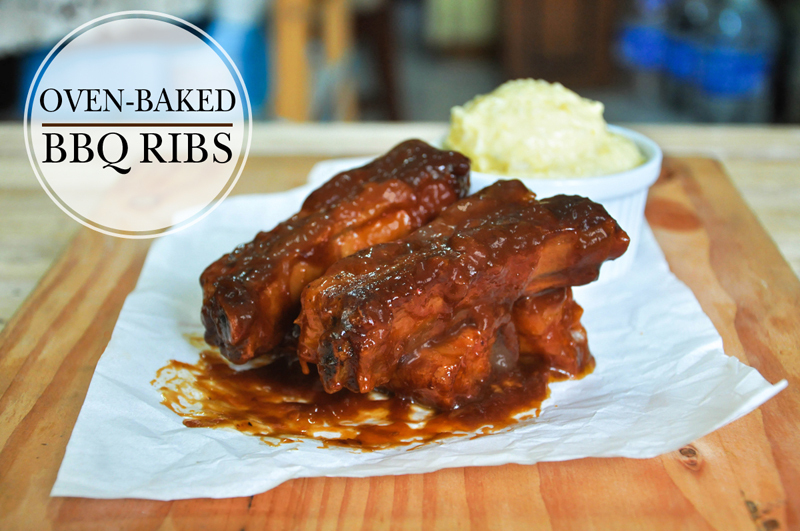 Easier, yes, but baking them for an hour makes the meat more tender and even more flavorful! While the ribs are baking, make the sauce. In a sauce pan oven medium heat, saute garlic in olive oil until fragrant. Add in onions and cook until caramelized, around 15 minutes. Add ketchup and water and stir to combine. Add in the rest of the ingredients, season with salt and pepper to your liking and simmer for 10 minutes. Remove from heat and cool partially for around 5 minutes. Transfer sauce to a blender or food processor and blend until smooth. 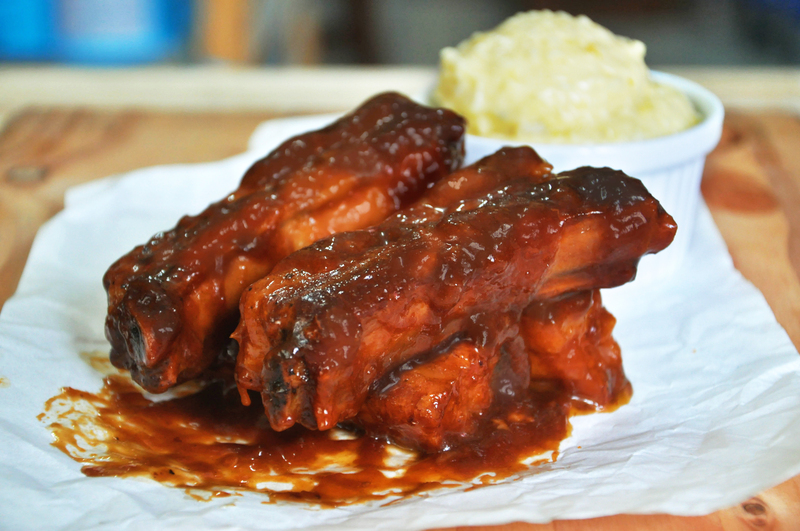 When the ribs are done baking for an hour, add the sauce over the ribs, making sure that every piece of rib is covered completely. Cover tightly with aluminum foil and bake for 1 hour and 30 minutes. Take out from the oven and carefully remove the cover. Again, flip the ribs and continue baking uncovered for another 30 minutes. Hi, I have yet to try this recipe with chicken. Since chicken somehow cooks softer than pork, and would cook faster, cutting the time in half seems right. Please let me know how it turns out. Thanks! first of all, this is the best bbq sauce i have ever made at home – so thanks, this recipe is surely for keeps!! Hi I'm Ken. I've always been fascinated with the culinary world even before I learned my ABCs. I remember waking up in the morning to the smell of my Grandma's freshly baked pastries and would while the time away watching her do magic in the kitchen. Having no formal culinary education (I graduated BFA maj in Advertising) I always spend my time watching Food Network TV shows and experiment dishes after dishes in my kitchen. Join me in my blog as I discover and share with you wonderful and yummy recipes. Have fun in the kitchen and happy eating!! !